Running a chain-saw 30 meters up a maple tree in Burk’s Falls, Ontario, Type-A Diabetic Umar Dechert has just had another black out. It is June 2006. Summer heat and physical labour combine, darkening his vision. He waits calmly until his vision returns, holding the machine still while its mechanized teeth chew at tree flesh. Days later speaking with Dr. Apramian in the Burk’s Falls Hospital, Umar expresses concern over the black outs, also mentioning that he runs a chain-saw. The doctor contacts the Ministry of Transportation later that day setting into motion a series of events that will see Umar lose his driver’s license, means of transportation, jobs, home, property and leave him bankrupt. In 1990 at 23 years old, Umar bought a property with the $24,000 he had saved. He cleared the 10 acre space and built a house and drive-in shed. He was a self-sufficient man for sixteen years. But losing his driver’s license would mean losing his northern pay cheque and moving to the big city. In Toronto he crashed on a friend’s couch until he felt he was imposing, then moved to the rowdy Salvation Army shelter at Queen East and Sherbourne Streets. Amid crack and heroin addicts, alcoholics, mentally disturbed men engaging in four fights per day, Umar now carried a pipe wrench in his back pocket. A far cry from his northern existence, where Umar had put his considerable skills to work. He knows how to lay dynamite and blow up beaver dams, clear-cut, raise livestock, grow vegetables, hunt and survive living off the land in the bush. 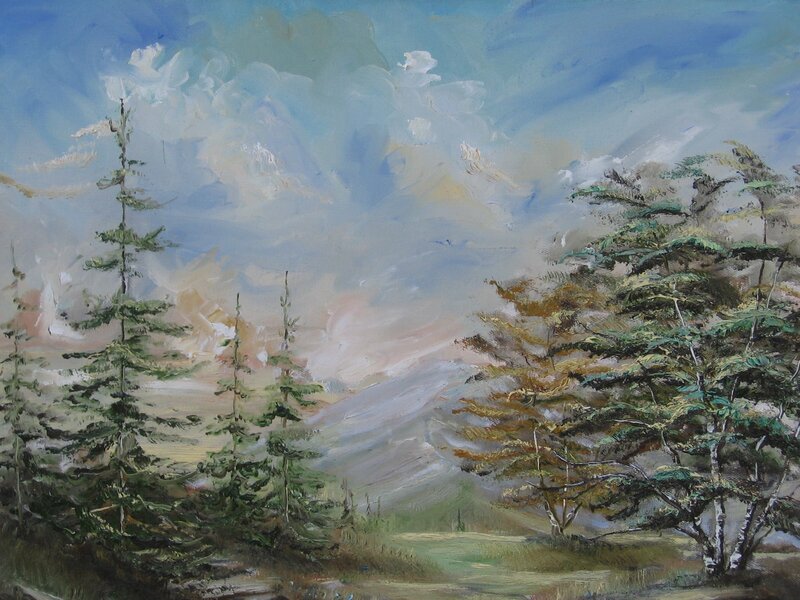 Such immersion in nature inspires a passion for landscape oil painting that has lasted 20 years. Though his paintings once sold at Arcadia Brothers Gallery in North Bay and Artisan’s of Muskoka for $350 – $700 retail, I meet him outside the AGO, on the corner of Dundas Street and McCaul Street, in the middle of winter asking $40 a painting. 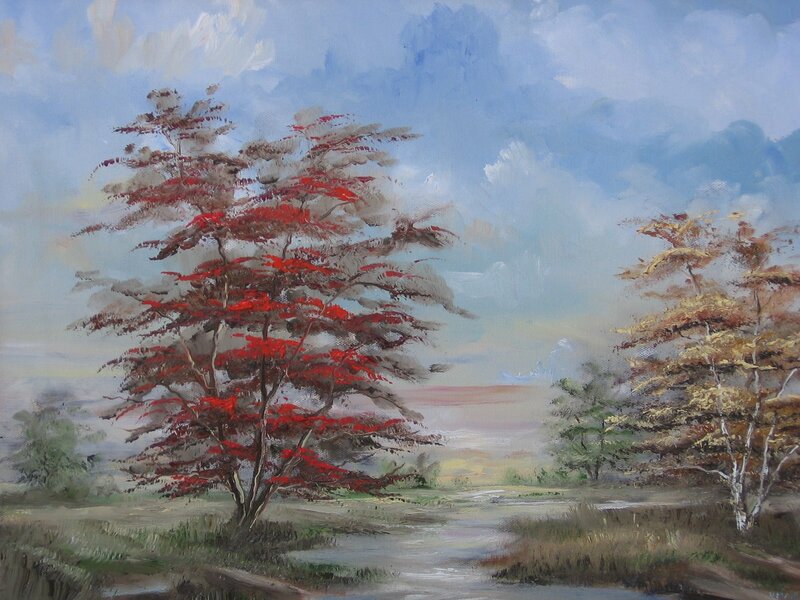 Before he exhausted nearly all of his financial resources, he cultivated his technique through art classes at the Dadashi Galleries in North York, where he met artist Aby Dadashi, who Dechert considers the best landscape painter in the world. Sitting in the Village by the Grange Food Court, Umar Dechert appears slight, verging on despair. But an edgy glint in his black eyes hints at an internal burning. “My goal is to be the second best landscape painter in Canada ever,” he says. “I try to look at a landscape and bring it alive,” Umar continues. The painting he holds displays a landscape of island pines dissected by a narrow passage of lake stretching toward the horizon. He has printed ‘Umar’ above his signature Rod Dechert. When he married his Muslim wife, he converted to Islam and changed his name to Umar. Using both names links his past to his present and future. A self-described “liberal Muslim,” he believes in the separation of mosque and state. He alludes to marital strain with his wife living overseas, but prefers not to discuss the details. When Rod ‘Umar’ Dechert walks into the Tim Horton’s at Bloor and Yonge for our second meeting, he sports a glossy black polyurethane trench coat. Looking like an unmasked Darth Vader, who has finally seen the light, he strides forward painting in hand, owning every movement. “I never turn down a free coffee,” he announces. Though art sales dipped though the winter, they are picking up again, earning him $80 – $180 per week. He smokes DJ Indian Reserve cigarettes when he feels angry, or stressed out and vents when speaking to his councillor or close friend. Umar shares a story written on the back of his painting entitled Ray of Hope through Man’s Uncertain Horizon. “This painting was almost stolen by a man on a bicycle, while I was selling on the southeast corner of the Ontario Art Gallery. I wildly chased him and he released this painting,” he reads. He didn’t beat the man, or pull him off the bicycle, but may have put a dent in a car he jumped over during the mêlée. Posing with his reclaimed work in his hands, in front of the Toronto Reference Library, Umar confidently faces the camera, a homeless man lies on the ground several cement columns behind. Gallery | This entry was posted in Canada, Magazine writing and tagged AGO, Arcadia Brothers Gallery, Bloor Street, Canada, Darth Vader, Dundas Street, McCaul, Ministry of Transportation, Muskoka, North Bay, North York, Queen Street, Salvation Army, Sherbourne Street, Toronto, Toronto Reference Library, TTC, Yonge Street. Bookmark the permalink.